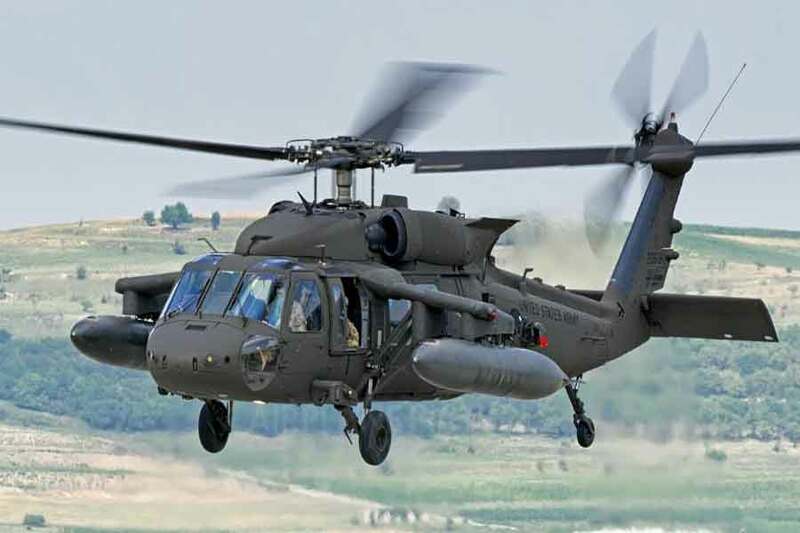 A team of US Army researchers have developed and tested acoustic emission sensors that can alert Black Hawk helicopter crew of structural damage to the aircraft before it leads to catastrophic failure. The newly developed sensing network has the potential to drastically cut the life cycle cost of Army vehicles and will enable condition-based maintenance or maintenance on demand. The work also supports the Army's long term vision of maintenance-free aircraft. Researchers with the US Army Research Laboratory (ARL) and the US Army Aviation and Missile Research, Development and Engineering Center said the use of the sensors on conceptual composite UH-60 Black Hawk rotorcraft opened up possibilities for new on board features that could alert the flight crew to structural damage like matrix cracking and delamination as they occur, giving the crew greater opportunity to take corrective actions. ARL’s two-year research program could lead to integrated real-time damage sensing on future airframe structures. The sensing method can be used to reliably detect and locate the initiation and growth of damage that may occur during service. "Future Army airframe structures are required to be lighter, safer and ultra-reliable," said Dr. Mulugeta Haile, a research aerospace engineer. "To achieve these, the Army must adopt a combined strategy of implementing advanced structural design methods, improved structural materials and integrated damage sensing and risk prediction capabilities." He said the team turned to acoustic emission tests because other methods such as ultrasonic and radiography require an external energy source in the form of a directed wave. "The external energy has the undesirable effect of interfering with other systems of the aircraft. In addition, other methods are not as good as AE in detecting early damage," he said. Acoustic emission sensing is a passive, non-destructive technique for detection of damage in the very early stages, long before the structure experiences catastrophic failure. Unlike other methods, acoustic emission detects damage in real-time when the damage is happening. It does not require an external energy source to detect damage. Haile said, "The Eureka moment was when the sensing network consistently identified and located the initiation and progression of damage during a prolonged fatigue test that lasted over 200,000 cycles—a feat that has never been achieved before." The ARL sensing network is composed of several lightweight transducers encapsulated in 3D-printed non-intrusive sensor mounts. Sensors of the network are optimally distributed in multiple zones to maximise coverage as well as the probability of damage detection. The data acquisition process is embedded with a software controllable timing parameter to reject reflections of a direct wave, as well as waves coming from non-damage related events. Meanwhile, the signal processing algorithm is augmented with a layer of adaptive digital filters to minimise effects of signal distortion during location analysis. Dr. Jaret Riddick, director of the Vehicle Technology Directorate, along with Haile, Nathaniel Bordick and other ARL partners, collaborated to elucidate detailed mechanisms for full-scale damage detection in complex rotorcraft structures using the distributed sensor architecture. "The downtime due to routine inspection and maintenance represent the major fraction of the life cycle cost of Army platforms, because we are not using the platform and we have to pay for inspection, which in most cases reveals no damage,” stated Riddick. “So the idea is to integrate a reliable damage sensing network and perform maintenance only when necessary. Currently, the US Army sustains its fleet using the phase maintenance paradigm, which is a periodic calendar-based practice that requires inspection and maintenance at fixed time intervals. The process is highly inefficient, costly and entails extended downtime. "Large-scale AE monitoring is a data-intensive process with several million hits being received by each transducer per flight," Halle said. "This puts a higher load on the internal bus and circuitry of any data acquisition hardware. In general, most hits are not related to damage. Rather, they are noises from moving parts such as the clicking or rubbing noises of fasteners, panel connections, and vibrations from other non-damage related sources. Halle said the challenge is to develop a system which is sensitive only to damage related hits and insensitive to all other hits. This story is adapted from an article published by the US Army Research Laboratories’ Public Affairs Dept.